In Queensland, people grow all kinds of crazy things in their backyards. At Jamie Stamp’s house in Ormeau, it happens to be a kickboxing gym. Jamie Stamp’s reputation has been growing in step with his gym. He won the Evolution title belt at Evolution 26 last year, stopping his opponent, Elliot Compton, in the first round. Jamie made his way into his first Muay Thai gym back in 2006, just before he turned eighteen. Vella, a former Melbournian, was one of the stars of Australian Muay Thai in the early nineties. He won nineteen of his twenty career fights, losing only to eventual world Thai Boxing champion and Boxing world-champion contender, Paul Briggs. He is probably best remembered for his win over Louie Isofidis, arguably the best pure kickboxer of that era. He carved out that win in the fashion of so many of his others; a grapple like a bear trap and surgical knees, all backed up by a cast-iron chin. Anthony is more than just a trainer to Jamie, he’s a mentor as well. The reason for that may be because Anthony’s dedication matches that of his fighters. “He’s working in the mines now, so he’s 4 days on, 3 days off. When he’s back in Ormeau, he always comes down to the gym as much as possible and holds pads for me. Before the Compton fight, I flew up to the mines in Moranbah to be there with him in the last 2 weeks. In the morning I’d do all my cardio, like swimming and running, and after he finished work, we’d go into this little shed and train every night. After pads, we’d do a half-hour of clinching to finish. Anthony weighs eighty-two kilos. He’s much heavier than me, so he worked me hard. In fact, I did all my grappling with him. His knees are devastating. After that, I came back down, cut the weight and fought at Evo. Jamie has used this approach to great effect, especially in is most recent fights. “I think the turning point for me was when I fought Beniah Douma on Eruption 23. He’s had a lot of fights. He fought Michael Tomahawk and beat him; he fought Daddy Kool and beat him, too. He’s got a reputation for being really tough. I went into that fight as the underdog. To tell you the truth, I was scared. As it went on though, I became more and more confident and then I stopped him, in the fourth round. While Jamie isn’t especially fond of the Thai approach, he has made good use of it to develop his skills. It’s more than just the standard of instruction that impressed Jamie. That intense, aggressive style worked to his advantage when fighting in Thailand. It was there that he met his toughest opponent to date. Jamie’s success over the last two years has come as he has discovered his real strengths, which have become the real basis of his style. Now he is in possession of them, he has the ability to see his way to an ultimate destination. It’s a contest and an outcome that fight fans await every bit as eagerly. No matter who those names are, Jamie is in with more than just a fighting chance. 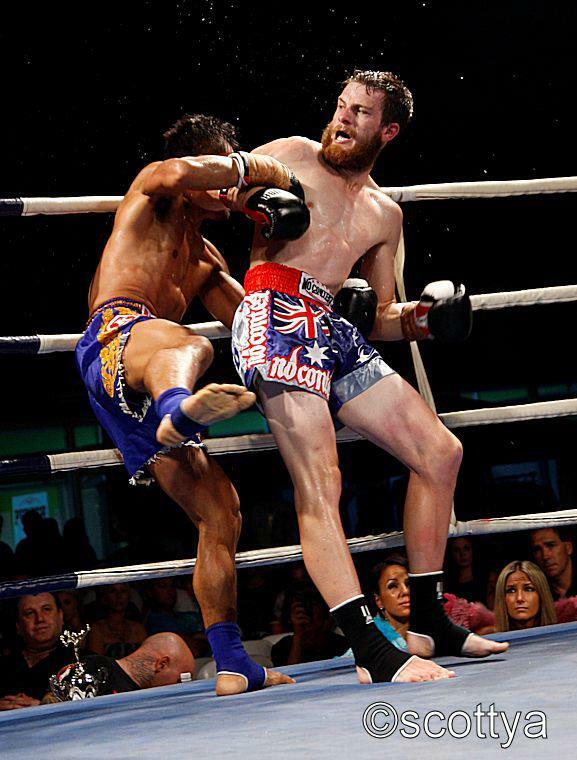 This entry was posted on April 12, 2013 at 11:44 pm and is filed under Kickboxing, Real Men with tags Anthony Vella, Bangkok, Beniah Douma, Chiang Mai, Daddy Kool, Elliot Compton, Eruption, Evolution, Joel Bowen, Kickboxing, Louie Isofidis, Lumpini, Moranbah, Muay Thai, Ormeau, Paul Briggs, Paul Demicoli, Saenchai, Team Quest, Thirteen Coins. You can follow any responses to this entry through the RSS 2.0 feed. You can leave a response, or trackback from your own site.